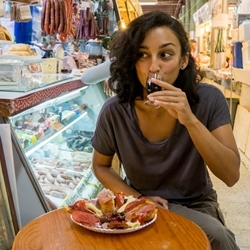 A London-based food and travel photographer and writer, Leyla spent the best part of 2015 eating her way around the world. Brought up surrounded by exceptional cooking from her Mauritian mother and Turkish-Cypriot father, getting acquainted with the huge range of international flavours available in the culinary world is something she spends a lot of time on. There are few places she's happier than in a restaurant, be that behind a lens or with wine and friends.